We have a couple of black walnut trees near our driveway. Until 2008 I had only paid passing attention to them, never taking the time to harvest the nuts at the right time. To do that, every day or two I would have to pick up the green balls that fell from the trees and throw them in the driveway. Driving over them would remove the green husks. Then I would gather the nuts to air-dry and store for later. If they weren’t gathered from the ground in a timely manner, I would find worms in them. Shelling them was a challenge. I tried cracking them using a hammer and by squeezing them in a vice. Both methods were unsatisfactory. You can find information about these methods and more at http://www.nemahaweb.com/blackwalnuts/crackers.htm. Black walnuts are much harder than the English walnuts you would find in the grocery store and regular nutcrackers won’t work for them. Finally I called my friend Margaret to borrow her black walnut cracker. Margaret and Jerry moved to their 50 acre farm in late 1982. They had black walnut trees in the yard and intended to make use of them. When Margaret told me of her search for a suitable nutcracker, I told her of an article I had recently read in the December 1983 issue of Organic Gardening magazine. I located that issue on my bookshelf while preparing to write this post. It still contained a note to Xerox the article for Margaret. (Back then we didn’t copy things, we Xeroxed them.) The article profiled four nutcrackers suitable for hard-shelled nuts—hickories, butternuts, and black walnuts. The Potter nutcracker was one of them, and the one owned by the authors, Mike and Nancy Bubel. At the time, I had also checked my copy of Home Food Systems which listed the Potter as the “largest, heaviest, most powerful nutcracker we tested.” Home Food Systems was published in 1981. Margaret bought one and has used it all these years. Our black walnut trees seem to bear every other year, so I didn’t throw myself into thinking about black walnuts again until the fall of 2010. The Resilient Gardener by Carol Deppe was hot off the press and the green balls were, once again, raining down. Deppe talks about gathering nuts in her book, specifically the need to get them off the ground promptly. I borrowed Margaret’s Potter nutcracker again. However, the best way to store nuts is in the shell, with the cracking done as needed. It became clear that I should have my own tool. With the harvest skipping a year, there were no new nuts to crack in 2011, but I still had some left from 2010 to play with. I had my eye out for a used Potter, since they aren’t manufactured anymore. What I found is the Master Nut Cracker, similar to the Potter. My husband gave me a Master Nut Cracker for Christmas last year. It is the one in the top photo and it came with a bag of black walnuts. It was just what I needed for my black walnuts—and as I found later—for the hazelnuts (filberts) and peanuts. 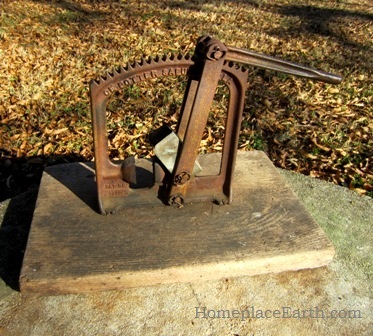 My husband had also given me small vice grips to use for the hazelnuts, an improvement over my other methods. I thought my hazelnuts would be too small for the Master Nut Cracker, but I found that it cracked all but the very smallest. Eventually I realized that I could shell peanuts with it, also. This nut cracker lives up to its expectations for cracking black walnuts. If you see advertisements for nutcrackers, read them carefully. If they list walnuts (rather than black walnuts), they mean English walnuts, which are easier to shell. One of the great things about this nutcracker is that it has a second set of anvils. You can see these in the picture. They’re inserted into their storage holes to the right on the board. Just unscrew the larger anvils and put these in and you’re all set to crack smaller nuts. These smaller anvils are what I put on for the hazelnuts. The anvils are concave, allowing you to crack the shells without smashing everything together, which is what happens using the hammer method. If you are thinking of getting a Master Nut Cracker, be on the watch for the Duke Nutcracker. The Duke is a Chinese knock-off and of lesser quality, according to what I’ve read. Often Chinese look-alikes are inferior and will soon break or be less than enjoyable to use. Do your internet homework and order from Gerald Gardner, developer of the Master Nut Cracker, himself. You will have to send a check to him and the address is on his website, along with the story of how it all came to be. 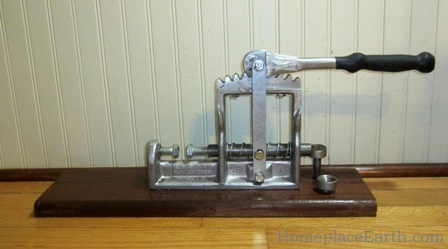 You might want to put a Master Nut Cracker on your Christmas wish list, like I did. Happy cracking! When we think of protein foods we normally think of meat, dairy and eggs. However, we can also get protein from plants. Beans and grains contain the most, but there is some protein in all vegetables. Of course, if you depended on a plant-based diet for your protein, you would be wise to look to the concentrated plant sources for your needs, unless you are eating a really large amount of food. Protein is used by the body for building and maintaining. It stands to reason if you are pregnant or nursing, or have been injured and need to repair tissue, your protein requirements would be higher than the recommended daily allowance of 46 grams/day for women and 56 grams/day for men. In my last post I talked about growing potatoes for needed calories. Potatoes have 7.7 grams of protein per pound, so if you ate a considerable amount of potatoes, you would also be racking up the protein. Carol Deppe spent a winter eating a lot of potatoes and wrote about it at http://caroldeppe.com/ThePotatoBin.html. On the other hand, if you ate corn and beans for protein, you would get about 40 grams of protein for each pound of corn you ate and over 100 grams per pound of dry beans. 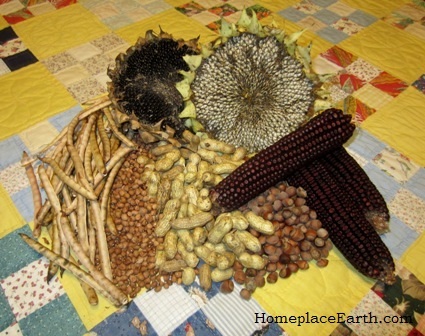 In addition to potatoes, Deppe grows her own beans and corn. If you are interested in growing a significant part of your diet, her book The Resilient Gardener needs to be on your reading list. Protein is made up of amino acids, many of which can be synthesized by the body, if enough nitrogen (protein) is available. However, there are eight amino acids, referred to as essential amino acids, that need to come from the food we eat. Animal sources have all the essential amino acids and plant sources do not. Interestingly enough, the ones the legumes (peas and beans) are lacking are the ones that the grains have plenty of, and vice versa. There are reasons for the traditional meals such as cornbread and beans, tortillas with beans, and beans and rice. Even peanut butter on whole wheat bread serves to give you the right combination. Beans and grains don’t need to be eaten at the same meal to get the benefit, but they both need to be in your diet somewhere. Besides protein and calories, including grains in your garden plan provides carbon in the form of stalks and straw for compost making, necessary for feeding the soil without bringing compost materials in. In my garden I have straw from wheat and rye in June and from cornstalks in the fall for compost. Besides the straw from wheat and rye, much organic matter is left in the soil from their decomposing roots. The legumes are soil enriching crops, leaving behind nitrogen for the next crop. The most nitrogen is left in the soil if the legume crop is harvested at flowering, as you would if you were growing it only as a compost crop. After that, nitrogen is put toward producing the beans or peas. Nevertheless, some nitrogen stays behind and it is good to have legumes in your rotation. Other protein sources from your garden are peanuts and sunflowers seeds. I harvest peanuts before the frost kills the vines, hanging them in the barn for the peanuts to dry on the vines. I pick off the peanuts when they are ready. You can see that in my DVD Cover Crops and Compost Crops IN Your Garden. The vines become compost material, but that peanut hay could also feed small livestock. Peanuts and sunflower seeds contain 117.9 and 108.9 grams of protein per pound respectively. These crops also supply needed fat in your diet. In addition, they can be used for cooking oil. More information about that is at my post https://homeplaceearth.wordpress.com/2012/07/10/using-a-piteba-oil-press/. Sunflower stalks, like the cornstalks, are used in the compost. In a permaculture garden you might have hazelnut (filbert) trees. Hazelnuts have 57.2 grams of protein per pound. My hazelnuts form a border on the north side of my garden. I wrote about hazelnuts at https://homeplaceearth.wordpress.com/2012/03/20/hazelnuts-filberts-in-my-garden/. Hazelnuts trees can be pruned, with the trimmings feeding your rocket stove. These nuts also provide fat in your diet and can be pressed for oil. Okay, I know you aren’t going to be eating a pound of beans or corn at a meal. In terms more easy to understand, a cup of boiled cowpeas (the beans I grow) has 13.3 grams of protein. I use ½ cup cornmeal, cooked with milk or water for a good-sized serving of cereal. That cornmeal has 5 grams of protein. A thick slice of homemade whole wheat bread has 3.9 grams of protein. A one ounce serving of peanuts has 7.4 grams. By comparison, a cup of milk contains 8 grams of protein and one large egg contains 6.3 grams. If you have enough calories in a varied homegrown diet, most likely you are getting enough protein. As you can see, growing grains for compost naturally gives you protein foods. If you were growing a significant part of your diet, you would also be concerned with having enough calcium. That’s the topic for next time. More about Growing Protein at http://www.motherearthnews.com/permaculture/growing-protein.aspx.